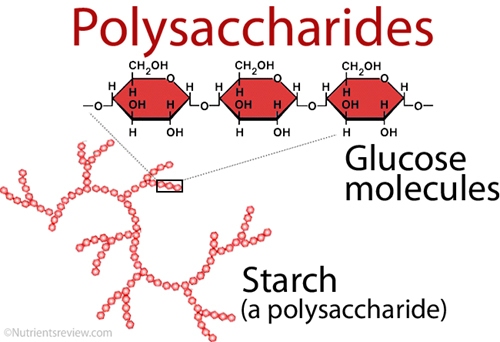 Polysaccharides [Greek poly = many; sacchar = sugar] are complex carbohydrates, composed of 10 to up to several thousand monosaccharides arranged in chains. The most common monosaccharides that appear as parts of polysaccharides are glucose, fructose, galactose and mannose. Digestible polysaccharides, such as starch, are digested (broken down) in the mouth and small intestine in several steps that eventually yield glucose, which is absorbed. They are a source of energy; they provide about 4 Calories (kilocalories) per gram. They also provide carbon atoms for the synthesis of fats, proteins and other substances in your body. Non-digestible polysaccharides or dietary fiber, such as cellulose, promote the passage of food through the gut and thus help maintain bowel regularity. Some non-digestible polysaccharides, such as inulin, may also promote the growth of beneficial intestinal bacteria. None of the polysaccharides are essential nutrients; you do not need to consume them in order to be healthy. Starch is in cereal grains (wheat, oats, rye, barley, buckwheat, rice, etc. ), potatoes and legumes (beans, peas, lentils). Fiber is mainly in whole grains (whole-grain bread, brown rice, etc. ), legumes, vegetables and fruits. A small amount of glycogen is in shellfish and animal liver. An indigestible fiber chitin and its derivative chitosan are in shells of crustaceans (crabs, shrimps). Naturally-occurring or artificially produced polysaccharides added to commercial foods as thickeners or fibers include various types of starches, dextrin, polydextrose, inulin and gums. Storage polysaccharides are a storage form of energy, for example cellulose in plants and glycogen in animals and humans. Structural polysaccharides give structure to plants; examples include cellulose in plants and chitin in the shells of crustaceans. Patel, “complex polysaccharides” is a term used for polysaccharides that contain atoms and molecules that are otherwise not found in carbohydrates. Examples of complex polysaccharides would be glycosaminoglycans (contains nitrogen) and heparin sulfate (contains sulfur). cellulose is storage polysaccharide I guess in plants also …..
I’m not sure if it is. how can polysccharides have hypoglycemic effect? Omnia, after a large carbohydrate (polysaccharide) meal, a lot of glucose is absorbed in a short time, which triggers the release of a great amount of the hormone insulin. Insulin allows glucose to move from the blood to the cells quickly, which can result in low blood glucose levels. This is known as reactive or postprandial hypoglycemia and it mainly occurs in individuals with rapid gastric emptying, for example in those who have half of their stomach surgically removed due to cancer or in individuals with gastric bypass. Some indigestible polysaccharides, for example soluble fiber in guar gum, can slow down the absorption of glucose and thus reduce blood glucose spikes after meals. what is microbial polysaccharides and its types? Pankaj, microbial polysaccharides are produced by bacteria and fungi. Here’s the Google search result for “microbial polysaccharides”. The first website (springer.com) has a table with a list of such polysaccharides, their composition and which microbe produces it. Examples are: alginate, cellulose, curdlan, dextran, gellan, hyalouran, levan, xanthan and pullulan. May you send link for legume and oil seed technology. It can’t search datail on Google. This is a link I posted in my previous answer. It is a pdf file that downloads on your computer. Thanks for the list! I’m allergic to some of these polysaccharides and now I know which ones I need to look out for. Xanthan gum and carrageenan cause me to go into lethargy spells that last for days until it wears off, but I’m sure those are not the only ones. Again, thanks! How carbs (poly) help in waste elimination . Please help me . Can you explain the question a bit more? A polysaccharide is a chemical therm that tells that a molecule is composed of many (poly) sugars (saccharides). Gums are mixtures of various polysaccharides. The term “gum” describes more its appearance than the chemical structure. Various gums are listed in the Chart 1 in the article above – you can check for individual articles for each gum. I’m not sure what exactly do you want to get from fruits. Great info, wonderfully explained thanks. Which polysaccharides is present in bread? .. The main polysaccharide in bread is starch. Whole-grain bread also contains indigestible polysaccharides, that is fiber, such as cellulose and arabinoxylan. Can you help me to identify which polysaccharide will create the most “elastic” viscosity gel when mixed with water? The application will be used to make a slime like substance, but needs to be much more “stretchy” than the standard class room borax based slime. Thank you. The non-gelling agents (eg, xanthan and guar gum), and gelling agents (carrageenan and locust bean gum) are commonly combined to achieve increased viscosity or superior properties of food gels, such as higher elasticity. So how does heat effect polysaccharides (moist and dry). Dry heat breaks down starch into dextrins. Moist heat causes the starch grains to swell so that the coating of cellulose is broken and softened. After being softened and swollen, the starch is said to be gelatinized. wonderful information, may you kindly tell me if animal food sources can have a negative effect on eyes. I have a problem with eyes of which I suspect is caused by such and so I drew suspense of them, please help I’m a teacher student. I’m not aware of any specific relationship between animal foods and eye problems. On the other hand, it is wise to limit foods to those you personally believe are good for you and avoid those you believe they are not. I’m not familiar with any relationship between polysaccharides and cancer. What are the major food sources of polysaccharides? You can see a detailed list in Chart 1 in the article. Please what are the 10 uses of carbohydrates in food industry???? Various carbohydrates can be used as food additives (sweeteners, thickeners, etc.) I did not cover this info here, but you can easily find them online. Which polysaccharide present in bread? Starch and various types of fiber. It is written above in the article. Some polysaccharides (starch) provide energy and building blocks for other carbohydrates, while others (fiber) help to maintain bowel regularity and normal intestinal flora. How would polysaccharides (and, if you also know, polyelectrolytes) be beneficial in an activated carbon/charcoal supplement with both long- and short-chain active carbon molecules? What would those polysaccharides/polyelectrolytes do for binding to toxins or metals? Do they help with absorption of nutrients, elimination of waste, or any other purpose? Thank you! I can’t answer that. This is far beyond the effects of the nutrients as generally described on this site. Glucose alone is readily entering the cells and breaking down to provide energy, so it is not appropriate as a forage form.